Everyday we drive past the Nacoochee Indian mound on our way to work. On any given day the spirit of the valley captures your imagination with its magical and spiritual elements. The more we pass by it the more obvious it becomes on why the Native Americans choose the valley to hold their ceremonies. So naturally we decided to write our first tourism blog on this sacred geological monument. 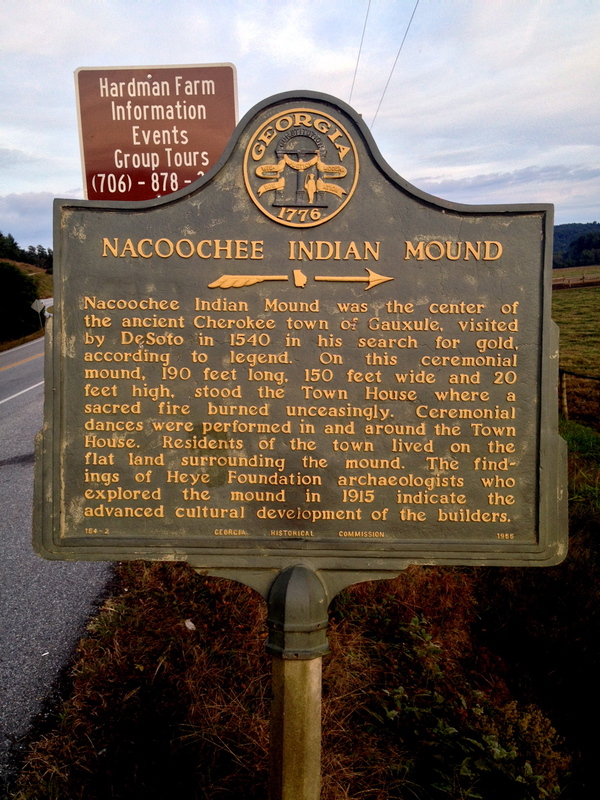 According to legend the Nacoochee Indian Mound was the center of the ancient Cherokee town of Gauxule. Originally the mound was 190 ft by 150 ft wide and 20 ft high. The ceremonies were held on top of the mound. 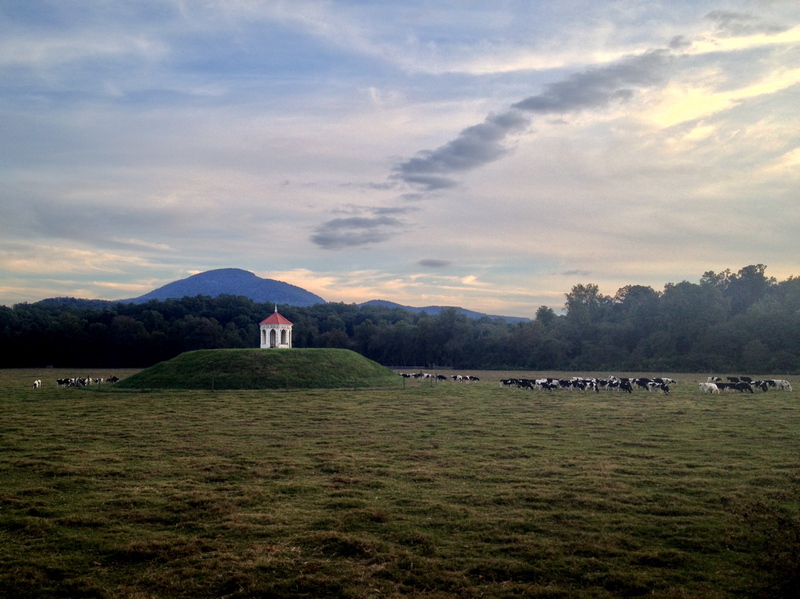 In the middle of the mound burned a sacred fire unceasingly. This place was the center of an ancient town with its residences living on the flat ground surrounding it. In 1915 the mound was fully excavated by Fredrick Webb Hodge, and George H. Pepper. The excavation uncovered 75 human burials, including 56 adults, 7 adolescents, and 4 children. The burials were layered dating from different time periods. About a 3rd of the individuals were buried with artifacts, indicative of social status , including hammered copper, stone celts, conch shell beads, cups, and elaborate Mississippian culture pottery. The site was occupied most intensively during the Mississippian period from 1350 to 1600. In the 1890s Capt. Nichols removed the top 2 feet of the mound and built a locally famous gazebo that now sits upon its summit. The history and natural beauty of this place it is easy to let your mind wander on simpler times long ago. With Mt Yonah watching over you and the mound like a proud parent it makes for an extremely comforting and relaxing visit. Some of the best times to view the mound are in the early morning and at sunset , especially if the mountains are misty. It is most definitely a great reminder of why we love living in the beautiful north Georgia mountains. Its a great place to check out next time you’re visiting the alpine village of Helen Georgia. We love it and we know you will too!! While you’re in town stop by the shop for a visit and remember “Stay Classy Y’all”. Best Tattoo Shop in Atlanta!!! We Moved Down The Street!! We are proud to announce our membership in the ABLH, Inc.
Join us in welcoming Chase Fain and Chris Owens to our 1920 Family!! !